We are a bit quirky here at The PromoDonna, and do believe we are quite a rare breed of individuals. However, it’s the tips and techniques we’ve learnt along the way which has helped us build confidence and fall in love with what we do, and you know what? You can do that too! After all, no one is born a sales professional, it’s about learning along the way which makes you one. 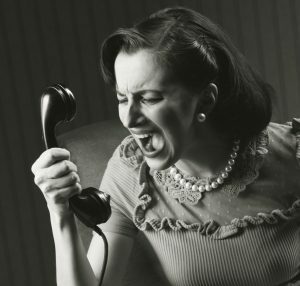 Now, we understand that you may not literally learn to ‘love’ cold calling, but we’re definitely making it our mission this month to help you overcome your fear of the phone. We’ll teach you ways to use the phone to your advantage to increase sales and reach your targets. We don’t believe in reading from a script like a robot – picture Phoebe in the episode of Friends trying to sell toner – though we do believe a script helps you go into the call with a focus of what you’re going to say. We suggest writing an elevator pitch (and writing and writing and writing) and coming up with possible objections or questions the prospect may have, with typical answers to the questions. By being prepared and knowing what you’re going to say you will come across as an ‘expert’ in your field and prospects will be more inclined to work with you. We highlighted above that you want to be portrayed as an ‘expert’ in your industry. The best way to do this is to speak with authority, and no we don’t mean pointing a finger and saying ‘NO!’. So Ashleigh decided to mimic the voices of people who spoke clearly and had a sense of authority in their voices – news reporters. By speaking clearly and with authority, you will begin to see the change of response in your prospects. We hear people constantly complain about having to do cold calls, constantly putting it off until finally the time of desperation comes and you’re forced to pick up the phone. You know what? Desperation will flow down the line. Before beginning any cold calling activity, it’s essential you place yourself in a positive mindset. After all, a cold call is simply a conversation to find out if you and your prospect are the right fit for each other, that’s it. Prepare yourself with your pitch, script and speak confidently and you’ll begin to find cold calling as simple as picking up the phone to call your bestfriend.